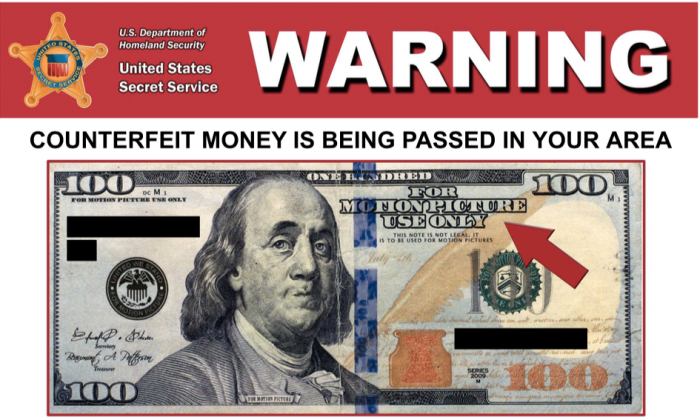 Police in El Paso, Texas, are warning people that they have seen a few cases of money used on movie sets being used as legal tender, and to be on the lookout. The bills, in $20 and $50 denominations, look like the real thing with serial numbers and banknote identifiers, except that they have “FOR MOTION PICTURE USE ONLY” written at the top, police say. They have put out fliers with an example of a $100 bill, and say the counterfeits have been seen in $20 and $50 bill denominations. Another way to identify the movie set money is to hold the bill up to the light. If there is no Franklin watermark and no embedded security thread on it, it’s a fake. While the “FOR MOTION PICTURE USE ONLY” at the top is a clear giveaway that it’s fake, it other types of fraudulent currency can be harder to spot. One way you can tell a counterfeit is by feeling the paper. The raised printing should make it feel a little rough to the touch, and this is true for all bills, even the $1 and $2 notes. For $5 bills and higher, there is a watermark that can be seen when the bill is held to light. The watermark on the $5 is a picture of President Lincoln. If the bill is face up, the mark will appear on the right side of the portrait in the blank space. The watermark can be seen from both sides. For the $10 bills, you can tell a counterfeit if the 10 on the front in the lower right corner doesn’t change from green to copper when you tilt it. When you hold the note to light, there should be an embedded thread that runs vertically to the right of the portrait when the bill is face up. The thread has “USA TEN” written on it, as well as a small flag. The thread can be seen from both sides of the bill, and will glow orange when put under ultraviolet light. If you look carefully at the right and the left sides of the $10 bill, “THE UNITED STATES OF AMERICA” and “TEN DOLLARS USA” is microprinted in the vertical borders, and directly below the portrait above the name Hamilton. You may need a magnifying glass to see the writing. The $20 bill has similar security features, but its embedded thread is to the left of Andrew Jackson’s portrait when the bill is face up, and glows green under ultraviolet light. It has microprinting that says “USA20” that can be found under the blue “TWENTY USA” ribbon to the right of Jackson’s portrait, and in black as part of the border under the treasurer’s signature. On the $50 bill, many of the security features are the same, but the number 50 in the lower right corner shifts from green to black instead of copper to green. The embedded thread is to the right of President Ulysses S. Grant’s portrait on a face-up bill, and turns yellow under ultraviolet light. “FIFTY” is microprinted in the vertical side borders of the face-up bill, and “THE UNITED STATES OF AMERICA” is microprinted on Grant’s collar on the left side. The $100 has the most security features of all. A blue ribbon to the left of President Benjamin Franklin has “100” and pictures of bells printed in 3-D that replace each other depending on how you tilt the bill. If you move the bill up and down, the “100’s” and bells move from side to side. If you tilt the bill from side to side, the “100’s” and bells move up and down. El Paso police are warning that people have been scammed by the counterfeit money using the buying and selling app “OfferUp.” They ask people who have been given fake money to get as many details on the person giving it to them as possible, including their license plate number if they have a vehicle. “All of those details will help the police in solving your case,” Petry told CBS4. El Paso police can be reached at 915-832-4400.